So this was the first time I have ever tried thai food and I have to say that I was not disappointed. I do have a cold so I may not be the best judge for thai food at this time. I decided to go with the wanton soup because what else does a sick person want? The women was very nice and seemed so happy to be doing her job. I ordered the hot tea, again for my sore throat and it helped me feel a little better for the moment. 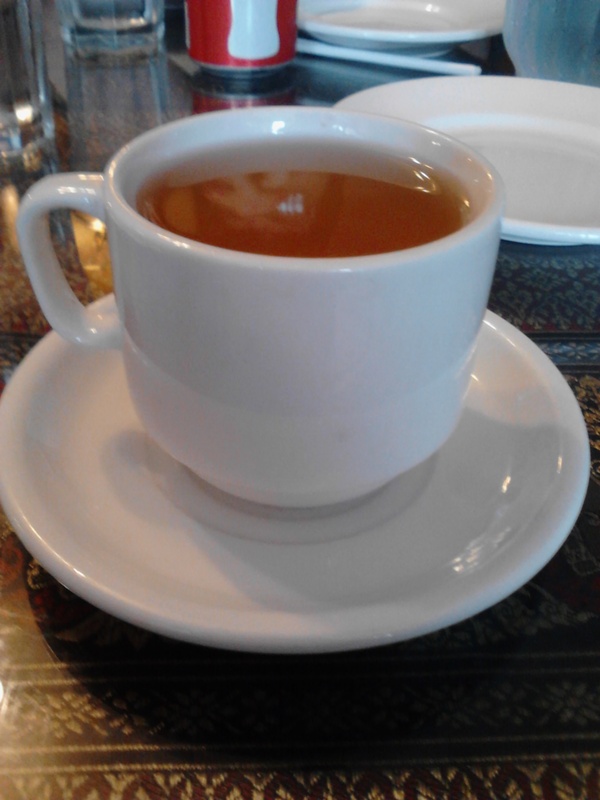 It seemed that the hot tea was a popular choice because when I looked around many people had a cup. The woman kept my cup full throughout my lunch. 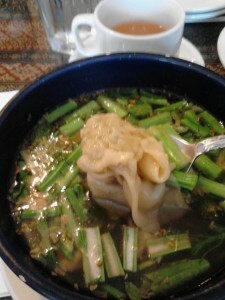 Like I said before I ordered the Wanton soup for lunch because I was not feeling well. When it came out I was surprised at how big the bowl of soup actually was. I have to say that the broth was very good, the seasonings that were used were great together. The different vegetables were also tasty they seemed to match with the soup very well. The wantons were also very good I liked the texture of the noodle around them, I could not really taste the pork at all that was inside the wantons but that could have been because I was sick. I shrimp that was in the soup I also really could not taste. I presentation of the soup was ok. when I got it all I could see was the green vegetables floating on top. After digging around I started to find the wantons and the shrimp. The wantons were pretty large from the picture below you can see that it was bigger than my spoon. 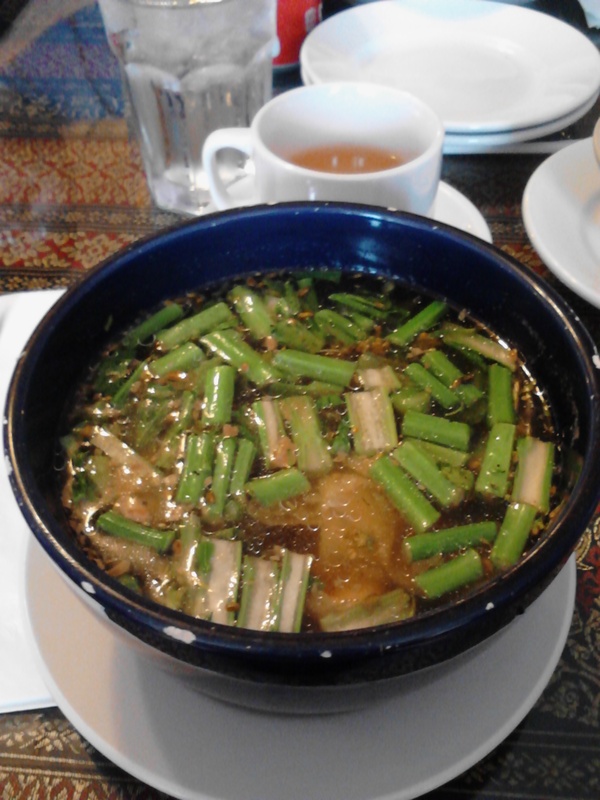 I think that I would go back to Diamond Thai because I enjoyed the soup and because the woman that waited on us was super nice. I think that I would probably choose to go at a different time though because it seemed quite busy at 12:30, lunch time. *Sorry this blog post is short, did not really pay attention to my surroundings as much because of my cold. This entry was posted in Uncategorized on May 23, 2013 by Daltynn. The opinions expressed by the Eating Siouxland May term bloggers and those providing comments are theirs alone, and do not reflect the opinions of the Morningside College. In addition, these blogs are written in order to learn about food blogging and do not necessarily contain "expert" opinions.